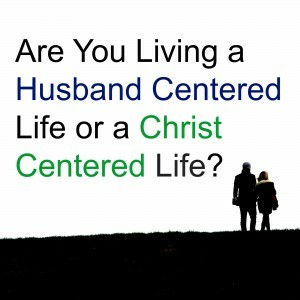 Is Your Life Husband Centered? Wow, I have been absent on my own blog for almost two weeks! Summer has gotten busy as it is quickly coming to an end and in all honesty I have been struggling to find anything marriage related to write about. My marriage hasn’t been the perfect example lately, old hurts have resurfaced stronger in my marriage, and we have been struggling once again. I would love to say that this doesn’t happen for us, but I would be lying. And, I think it’s somewhat normal, even though it may not be right. Because of this, I just haven’t felt like I had much to say that could inspire, encourage, or teach anyone else, however, today I was doing some reading in The 7 Habits of Highly Effective People by Stephen R. Covey and I realized I might have been wrong. See, this morning I was reading about how people have different things as their “center”. Now, we should be living principal centered lives (where we are centered around core principals that don’t change), but that is a tough balance and most of us are off in one way or another. There are tons of other centers that we incorrectly base our life around: work centered, self-centered, pleasure centered, or money centered to name a few. However, it was the very first one I read that struck a chord in me: spouse centered. Right away I was able to identify that this is part of where my problem has been with being stuck in this crazy cycle in our marriage. While I believe whole-heartedly that America is suffering because marriage has become so corrupt and lost in our society as to what God truly designed it to be, I can also see that we can swing too far the other way. While some people do not put the proper amount of time, attention, and priority on their marriage, some of us put too much on it. So much so that we take our self-worth from our marriage and not from God. Why is this a problem? If I base my sense of worth on how my husband is treating me, I am in a lot of trouble when he is disappointed, angry, bitter, and resentful. When my husband expresses these feelings to me, I shut down. I feel like everything I am doing is a waste of time because I feel worthless. When my husband is happy with me or communicates that I am doing something well, I fell great and start getting things done. Wow, this is crazy when I really think about it as I type it. I have caused my husband pain in our marriage. I have been far from the wife that I would like to be. But, I have repented and strive to live better each day with help from God. I know that I have been forgiven for my past wrongs and that I am free in God’s eyes to move forward and do better. However, my husband isn’t God and isn’t always on the same page as him. So, I end up feeling weighted down by the past and falling back into a cycle of sadness, hopelessness, and pity. While it is important to put proper importance on our husbands and their opinions and keeping them as a priority in our life, it is important that Christ stay the center of our life. When my husband takes place in the center, my whole life is out of balance. We CANNOT make another imperfect person the center that we base everything on. We CANNOT take our self-worth from the opinions of others because we are imperfect and even the best of us will disappoint, upset, and offend others at times. Do you struggle with this balance in your marriage? Do you have something or someone in the center that shouldn’t be there? Good thoughts. Thanks for sharing. This is one lesson that I want to also pass onto my children – and from this perspective of a husband – particularly my girls. They need to know their value and handle relational conflict knowing who they are. Sharing this week!